cook. clean. sew. (repeat. ): Winter quilt finished! 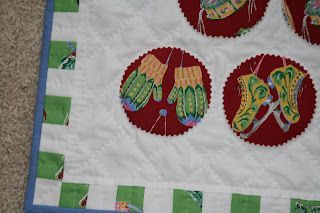 This morning I finished the quilt I was making for the winter quilt swap going on in blogland. I am pretty happy with how it turned out. 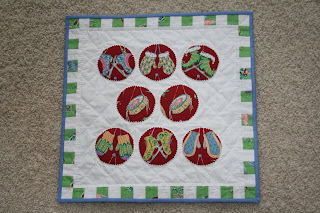 My original design did not have a pieced border or as much quilting as the quilt ended up with, but I have always felt that quilting was a process not to be rushed, and I am happy with the end result. I hand-quilted a grid around the circles, and did a minimal amount of quilting in the borders, as you can see from the detail shot. Here is the backing fabric... I showed this fabric when I first bought it, and I was happy to have a chance to use it already. The woman I made this for wanted a modern, whimsical quilt, and lime green is her favorite color. This backing, while not exactly lime green, is fairly close (the lighting isn't very good today!) I ended up really loving this quilt, and may make a similar one for myself... I hope *** likes it too. 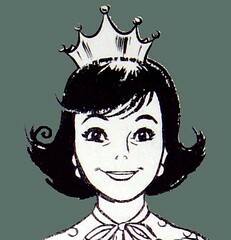 I just came across your blog, so sweet! And your quilt is beautiful, I love the colors! It's beautiful! How big is it -- I can't tell from the picture and am curious. By-the-way, when do find time for those kinds of projects? That little quilt is just adorable! Very nice job! Bethany... it is about 16 inches square. It's wonderfully whimsical, Ginger. The border really completes the quilt. I think I'd have a hard time giving this away, also. Ginger, it looks great! I just went to the Road to California Quilt show on Saturday with Angela and got very inspired. Hopefully I'll be quilting again soon. very very cute! your quilts are always beautiful, definitely an inspiration. anyway... not to be a bother. but i just wanted to check. as heidi klum would say: are you in or are you aut? (for the swap that is?) you commented that you were interested, but i never heard from you. but gmail very easily could have eaten your email. i emailed you as well, but i wasn't sure if it actually went out. email me at kLewis@buildingmp.com there is still some time, i'm still matching up a couple of others who got "lost"
great job! what a beautiful quilt. 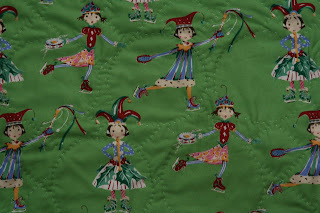 I love it...I'm going to take a quilting class with a friend soon...I can't wait to get back into the "mode."